Alex Popescu talks about Drizzle replication in his MyNoSql column. He makes a very interesting observation in his post regarding Drizzle's replication capabilities into a host of NoSQL storage backends ..
"Leaving aside the technical details — which are definitely interesting .., the solution using the Erlang AMQP .. implementation RabbitMQ .. — I think this replication layer could represent a good basis for SQL-NoSQL hybrid solutions". We are going to see more and more of such hybrid solutions in the days to come. Drizzle does it at the product level. Using RabbitMQ as the transport, Drizzle can replicate data as serialized Java objects to Voldemort, as JSON marshalled objects to Memcached or as a hashmap to column family based Cassandra. Custom implementation projects have also started using the hybrid stack of persistent stores. When you are dealing with real high volumes and patterns of access where you cannot use joins, anyway you need to denormalize. ORMs cease to be a part of your solution toolset. Data access patterns vary widely across the profile of clients using your system. If you are running an ecommerce suite and your product is launched you may have an explosive use of the shopping cart module. It makes every sense to move your shopping cart from the single relational data store where it was lying around and have it served through a more appropriate data store that lives up to the scalability requirements. It's not that you need to throw away your relational database that has served you so long. Like Alex mentioned, you can always go along with a hybrid model. In one of our recent projects, we were using Oracle as the main relational database for a securities trading back office solution implementation. The database load was computed based on all calculations that were done initially. In a very late stage of the project a new requirement came up that needed heavy processing and storage of semi-structured data and meta-data from an external feed. Both the data and the meta-data were extensible which meant that it was difficult to model them with a fixed schema. We could not afford frequent schema changes since it would entail long downtime of the production database. But there also was the requirement that after processing of these semi-structured data lots of them will have to be made available in the production database. We could have modeled it following the key/value paradigm in Oracle itself, which we were using anyway as the primary database. But that's again going down the age old saying of the hammer and nail story. We decided to supplement the stack with another data store that fits the bill for this specific use case. We used MongoDB, that gave us phenomenal performance for our requirements. We were getting the feed from external data sources and loaded our MongoDB database with all the semi-structured data and meta-data. All necessary processing was done in MongoDB on those data and relevant information from MongoDB were pushed to JMS based queues for consumption by appropriate services that copied data asynchrnously to our Oracle servers. What did we achieve with the above architecture ? Kept Oracle free to do what it does the best. Took away unnecessary load from production database servers. Introduced a document database for serving a requirement tailor made for its use - semi structured data, mainly reads, no constraints, no overhead of ORM ceremony. MongoDB supports a very clean programming model, a very decent query interface, simple to use and easy to convince your client. Used message based mapping to sync up data ASYNCHRONOUSLY between the nosql MongoDB and sql based Oracle. Each of the data stores were doing what they do the best, keeping us away from the blames of the hammer-nail paradigm. With more and more of the nosql stores coming up, message based replication is going to play a very important role. Even within the nosql datastore, we are seeing choices of sql based storage backends being offered. Voldemort offers MySql as one of the storage backends - so the hybrid model starts right up there. It's always advisable to use multiple storage that fits your use case than trying to force-fit everything into a single paradigm. Over the weekend I upgraded my Chrome to the developer channel and played around a bit with Web Sockets. It's really really exciting and for sure will make us think of Web applications in a different way. Web Sockets have been described as the "TCP for the Web" and will standardize bidirectional communication technology for Web applications. The way we think today of push technology is mostly through Comet bsed implementations that use "long polling". The browser sends a request to the server and then waits for an event to happen and then sends a response. The client, on getting the response consumes it, closes the socket and does a new long polling connection to the server. The communication is not symmetric and connections can drop off and on between the client and the server. Also, the fact that Comet implementations are not portable across Web containers make it an additional headache to portability of applications. Atmosphere offers a portable framework to implementing Ajax/Comet based applications for the masses. But still it does not make the underlying technology painless. Web Sockets will make applications much more symmetric - instead of having long polling it's all symmetric push/pull. Once you get a Web Socket connection, you can exchange data between the browser and the server through send() method and an onmessage event handler. Talking about event based programming, we all saw the awesomeness that Ryan Dahl demonstrated a few weeks back with evented I/O in Node.js. Now people have already started developing experimental implementations of the Web Socket protocol for Node.js. And I noticed just now that Jetty also has a WebSocket server. 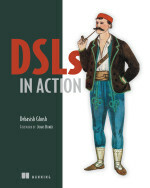 DSLs In Action has been out for a month now in MEAP with the first 3 chapters being published. DSL is an emerging topic and I am getting quite some feedback from the readers who have already purchased the MEAP edition. Thanks for all the feedback. Writing a book also has lots of similarities with coding. Particularly the refactoring part. The second attempt to articulate a piece of thought is almost always better than the first attempt, much like coding. You cannot imagine how many times I have discarded my first attempt and rewrote the stuff only to get a better feel of what I try to express for my readers. I delivered Chapter 4 and already got quite a few feedbacks on it. Chapter 4 starts the DSL Implementation section of the book. From here onwards expect lots of code snippets, zillions of implementation techniques that you may try out on your IDE. Chapter 4 deals with Implementation Patterns in Internal DSL. I discuss some of the common idioms that you will be using while implementing internal DSLs. As per the premise of the book, the snippets and idioms are in Ruby, Groovy, Clojure and Scala. It's more of a focus on the strengths of each of these languages that help you implement well designed DSLs. This chapter prepares the launching pad for some more extensive DSL implementations in Chapter 5. It's not there in MEAP yet, but here's the detailed ToC for Chapter 4. Chapter 5 is also in the labs right now. But almost complete. I hope to post another update soon ..
Are ORMs really a thing of the past ? Stephan Schmidt has blogged on the ORMs being a thing of the past. While he emphasizes on ORMs' performance concerns and dismisses them as leaky abstractions that throw LazyInitializationException, he does not present any concrete alternative. In his concluding section on alternatives he mentions ..
"What about less boiler plate code due to ORMs? Good DAOs with standard CRUD implementations help there. Just use Spring JDBC for databases. Or use Scala with closures instead of templates. A generic base dao will provide create, read, update and delete operations. With much less magic than the ORM does." Unfortunately, all these things work on small projects with a few number of tables. Throw in a large project with a complex domain model, requirements for relational persistence and the usual stacks of requirements that today's enterprise applications offer, you will soon discover that your home made less boilerplated stuff goes for a toss. In most cases you will end up either rolling out your own ORM or start building a concoction of domain models invaded with indelible concerns of persistence. In the former case, obviously your ORM will not be as performant or efficient as the likes of Hibernate. And in the latter case, either you will end up building an ActiveRecord model with the domain object mirroring your relational table or you may be more unfortunate with a bigger unmanageable bloat. It's very true that none of the ORMs in the market today are without their pains. You need to know their internals in order to make them generate efficient queries, you need to understand all the nuances to make use of their caching behaviors and above all you need to manage all the reams of jars that they come with. Yet, in the Java stack, Hibernate and JPA are still the best of options when we talk about big persistent domain models. Here are my points in support of this claim .. If you are not designing an ActiveRecord based model, it's of paramount importance that you keep your domain model decoupled from the persistent model. And ORMs offer the most pragmatic way towards this approach. I know people will say that it's indeed difficult to achieve this in a real life world and in typical situations compromises need to be made. Yet, I think if you need to make compromise for performance or whatever reasons, it's only an exception. Ultimately you will find that the mjority of your domain model is decoupled enough for a clean evolution. ORMs save you from writing tons of SQL code. This is one of the compelling advantages that I have found with an ORM that my Java code is not littered with SQL that's impossible to refactor when my schema changes. Again, there will be situations when your ORM may not churn out the best of optimized SQLs and you will have to do that manually. But, as I said before, it's an exception and decisions cannot be made based on exceptions only. ORMs help you virtualize your data layer. And this can have huge gains in your scalability aspect. Have a look at how grids like Terracotta can use distributed caches like EhCache to scale out your data layer seamlessly. Without the virtualization of the ORM, you may still achieve scalability using vendor specific data grids. But this comes at the price of lots of $$ and the vendor lock-ins. Stephan also feels that the future of ORMs will be jeopardized because of the advent of polyglot persistence and nosql data stores. The fact is that the use cases that nosql datastores address are very much orthogonal to those served by the relational databases. Key/value lookups with semi-structured data, eventual consistency, efficient processing of web scale networked data backed with the power of map/reduce paradigms are not something that your online transactional enterprise application with strict requirements of ACID will comply with. So long we have been trying to shoehorn every form of data processing with a single hammer of relational databases. It's indeed very refreshing to see the onset of nosql paradigm and it being already in use in production systems. But ORMs will still have their roles to play in the complementary set of use cases. Just wanted to share the detailed Table of Contents of the chapters that have been written so far. Please send in your feedbacks either as comments on this post or in the Author Online Forum. The brief ToC is part of the book home page. Let me know of any other topic that you wopuld like to see as part of this book. 1.6. DSL - What's in it for Non-Programmers? My book DSLs in Action (see sidebar) is now available in MEAP (Manning Early Access Program). I have planned it to be one totally for the real world DSL implementers. It starts with a slow paced introduction to abstraction design, discusses principles for well-designed abstractions and then makes a deep dive to the world of DSL based development. The first part of the book focuses on usage of DSLs in the real world and how you would go about setting up your DSL based development environment. The second part is focused entirely on implementation techniques, patterns and idioms and how they map to the various features offered by today's programming languages. The book is heavily biased towards the JVM. The three most discussed languages are Scala, Ruby and Groovy, with some snippets of Clojure as well. The book is still very much a WIP. Please send all of your feedbacks in the Author's Forum. It can only make the quality better. NoSql is here. Yes, like using multiple programnming languages, we are thinking in terms of using the same paradigm with storage too. And why not? If we can use an alternate language to be more expressive for a specific problem, why not use an alternate form of storage that is a better fit for your requirement? More and more projects are using alternate forms of storage for persistence of the various forms of data that the application needs to handle. Of course relational databases have their very own place in this stack - the difference is that people today are not being pedantic about their use. And not using the RDBMS as the universal hammer for every nail that they see in the application. Consider an application that needs durability for transactional data structures. I want to model a transactional banking system, basic debit credit operations, with a message based model. But the operations have to be persistent. The balance needs to be durable and all transactions need to be persisted on the disk. It doesn't matter what structures you store underneath - all I need is some key/value interface that allows me to store the transactions and the balances keyed by the transaction id. I don't even need to bother what form of storage I use at the backend. It can be any database, any key-value store, Terracotta or anything. Will you give me the flexibility to make the storage pluggable? Well, that's a bonus! Enter Akka .. and its pluggable persistence layer that you can nicely marry to its message passing actor based interface. Consider the following messages for processing debit/credit operations .. In the above messages, the failer actor is used to report fail operations in case the debit fails. Also we want to have all of the above operations as transactional, which we can make declaratively in Akka. Here's the basic actor definition ..
accountState is a persistent Map that plugs in to a MongoDB based storage, as is evident from the config parameter. In real life application, this will be further abstracted from a configuration file. Earlier I had blogged about the implementation of the MongoDB layer for Akka persistence. accountState offers the key/value interface that will be used by the actor to maintain the durable snapshot of all balances. Let us now look at the actor interface that does the message receive and process the debit/credit operations .. Note that the interfaces that these implementations use is in no way dependent on the MongoDB specific APIs. Akka offers a uniform key/value API set across all supported persistent storage. And each of the above pattern matched message processing fragments offer transaction semantics. This is pluggability! Credit looks very similar to Debit. However, a more interesting use case is the MultiDebit operation that offers a transactional interface. Just like your relational database's ACID semantics, the transactional semantics of Akka offers atomicity over this message. Either the whole MultiDebit will pass or it will be rollbacked. if (bal > m) failer !! "Failure"
Now that we have the implementation in place, let's look at the test cases that exercise them ..
First a successful debit test case. Note how we have a separate failer actor that reports failure of operations to the caller. And now the interesting MultiDebit that illustrates the transaction rollback semantics .. In the snippet above, the balance remains at 5000 when the debit fails while processing the final amount of the list passed to MultiDebit message. Relational database will always remain for the use case that it serves the best - persistence of data that needs a true relational model. NoSQL is gradually making its place in the application stack for the complementary set of use cases that need a much loosely coupled model, a key/value database or a document oriented database. Apart from easier manageability, another big advantage using these databases is that they do not need big ceremonious ORM layers between the application model and the data model. This is because what you see is what you store (WYSIWYS), there is no paradigm mismatch that needs to be bridged. In his book To Mock a Mockingbird, Raymond Smullyan teaches combinatory logic using songbirds in a forest. He derives important results combining various combinators, all using the birds of the enchanted forest. Combinators are an effective tool in designing abstractions with functional programming principles. They are reusable units, make you code very concise, without losing on the expressivity. More than the implementation, the names can go a long way in establishing a common vocabulary of programming idioms and techniques. In an earlier post, I talked about Kestrel, and its implementation in Scala for handling side-effects in an abstraction. In this post, I look at Thrush, a permuting combinator. A Thrush is defined by the following condition: Txy = yx. Thrush reverses the order of evaluation. Raganwald talks about Thrush and its implementations in Ruby in an excellent post quite some time back. Why would you want to reverse the order of evaluation in a computation ? Well, if you value readability of your code, and have been cringing at how a mix of expression oriented pipelines and nested function calls can make your code less readable, then a Thrush may be for you. Consider the Ruby example that Raganwald discusses in his first example of Thrush implementation. The argument to the proc is a pipeline expression that reads nicely from left to right : get the list of numbers from 1 to 100, select the odd ones and add them up. What the proc does is it finds the square of its input number. But the proc invocation is a function call, which, though is the last in sequence to be executed, has to be the first one that you read. You can find the Ruby implementation in Raganwald's blog that transforms the above code to a left-to-right pipeline expression using Thrush. Let's try to see how we can do the same in Scala .. In Scala, I can write the above as .. Almost the same as the Ruby code above, and has the similar drawback in readability. Let's define the Scala Thrush combinator .. Immediately we can write the above invocation as ..
A very simple combinator, a permuting one that pushes the function to where it belongs in the line of readability. If you want to be more succinct, commit the sin of defining an implicit for your use case ..
and immediately the above transforms to .. Does it read better ? In fact with this implicit definition, you can go chaining into all the way .. While designing domain APIs that need to be expressive, this technique can often come very handy. Here's an example that uses the Thrush combinator to ensure a clean pipeline expression flowing into a piece of DSL. Consider the following piece of logic that we frequently come across in codebases .. Step 2 is only for some side-effecting operations, maybe on the instance itself or for some other purposes like logging, registering, writing to database etc. While working on the serialization framework sjson, I have been writing pieces of code that follows exactly the above pattern to create Scala objects out of JSON structures. Now if you notice the above 3 steps, step 2 looks like being a part of the namespace which calls the function that sets up x. But logically step 2 needs to be completed before we can use x. Which means that step 2 is also a necessary piece of logic that needs to be completed before we hand over the constructed instance x to the calling context. One option of course is to make Step 2 a part of the function in Step 1. But this is not always feasible, since Step 2 needs access to the context of the caller namespace. Let's look at an idiom in Scala that expresses the above behavior more succinctly and leads us into implementing one of the most popularly used objects in combinatory logic. Consider the following method in Scala that creates a new instance of a class with the arguments passed to it .. I can use it like ..
for a class Person defined as .. It's often the case that I would like to have some operations on the new instance after its creation which will be pure side-effects. It may or may not mutate the new instance, but will be done in the context of the new instance. I can very well do that like .. It works perfectly .. but we can make the code more expressive if we can somehow be explicit about the context of the block of code that needs to go with every new instance of Person being created. Maybe something like .. This clearly indicates that the side-effecting steps of adding to the global list of persons or sending out a mail to every member is also part of the creation process of the new person. The effect is the same as the earlier example, only that it delineates the context more clearly. Though at the end of it all, it returns only the instance that it creates. Consider another example of a good old Java bean .. Working with a reflection based library it's not uncommon to see code that instantiates the bean using the default constructor and then allow clients to set the instance up with custom values .. something like ..
Once again the block is only for side-effects, which can contain lots of other custom codes that depends on the caller's context. Make it more concise, DSLish using the object import syntax of Scala ..
Looks like a piece of idiom that can be effective as part of your programming repertoire. Here is the version of newInstance that allows you to make the above happen .. Looking carefully at newInstance I realized that it is actually the Kestrel combinator that Raymond Smullyan explains so eloquently in his amazing book To Mock a Mockingbird. A bird K is called a Kestrel if for any birds x and y, (Kx)y = x. And that's exactly what's happening with newInstance. It does everything you pass onto the block, but ultimately returns the new instance that it creates. A nice way to plug in some side-effects. Reg has blogged about Kestrels in Ruby - the tap method in Ruby 1.9 and returning in Rails. These small code pieces may not be as ceremonious as the popularly used design patterns, but just as effective and provide deep insights into how our code needs to be structured for expressivity. Next time you discover any such snippet that you find useful for sharing, feel free to write a few lines of blog about it .. the community will love it ..